Sorry, no images found attached to this page. 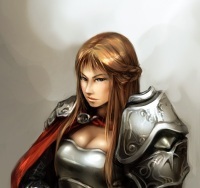 Weapon and Armor Proficiency: A fighter is proficient with all simple and martial weapons and with all armor (heavy, light, and medium) and shields (including tower shields). +2 to One Ability Score: Human characters get a +2 bonus to one ability score of their choice at creation to represent their varied nature. Medium: Humans are Medium creatures and have no bonuses or penalties due to their size. Normal Speed: Humans have a base speed of 30 feet. Bonus Feat: Humans select one extra feat at 1st level. Skilled: Humans gain an additional skill rank at first level and one additional rank whenever they gain a level. Languages: Humans begin play speaking Common. Humans with high Intelligence scores can choose any languages they want (except secret languages, such as Druidic).